Slack is a communication hub for any size organization, but when you work within larger groups, it’s worth taking a little extra care to be deliberate and considerate about the ways you interact with everyone. A good rule of thumb for organizations with hundreds to thousands of employees is to create plenty of specialized channels for different teams, subject matter, and projects, each with a couple dozen participants or less. These smaller, functional channels are a perfect place for teams to hash out every detail of their work with lots of messages, discussions, and automated posts from apps. But what about larger channels? For cross-functional and general-subject-matter channels, you can easily have hundreds of participants, and when a channel’s membership grows that big, it’s worth considering everyone’s collective time before you post. Here are a few key tips to keep in mind when collaborating in crowded channels. Pay close attention to the channel information along the top of your Slack app, and know that when you see lots of participants, it’s a good idea to adjust your internal bar for posting. If you have a general question for a very large group, always search the channel before asking, since you might find that the answer has been previously discussed. Don’t forget to check the pinned items in larger channels, since teams will often post answers to common questions or provide information for frequent requests. At Slack, each office location has a channel, like #sf or #dub, with pinned items that include a visitor guide to the office, instructions for booking nearby hotels, and a visiting employee form to alert local office staff to your impending arrival. 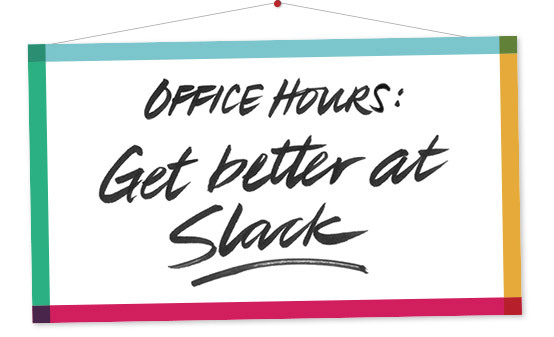 Every week, a handful of employees visit other office locations at Slack, and without these reference materials, each office’s channel would be filled with repeated requests from traveling workers. If search and pinned documents don’t have your answer, you may want to ask an expert. 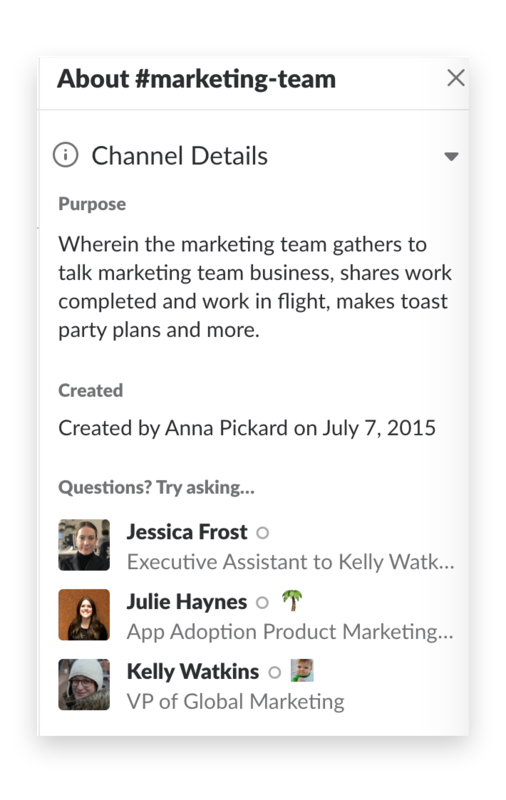 Slack automatically highlights the top three users in larger channels and displays a list in the sidebar for you. For channels with more than a few dozen members, you’ll want to organize topics of discussions to keep them both easy to follow and to fetch at a later date. Use the threads feature to answer questions or provide more detailed feedback on any message. This keeps the main message area clear for other topics and allows a group of people to maintain several topics of discussion at once, since each topic is in a separate thread. Organized conversations also preserve context that can be retrieved at any time with a search, where you can see all the thoughts and feedback that went into a past decision. As channel membership grows, you’ll want to start slowing news and updates to a weekly or monthly cadence rather than overwhelming everyone with daily posts. Posts or a Google Doc are easy ways to compose longer announcements and can even serve as a quasi internal newspaper for a company. 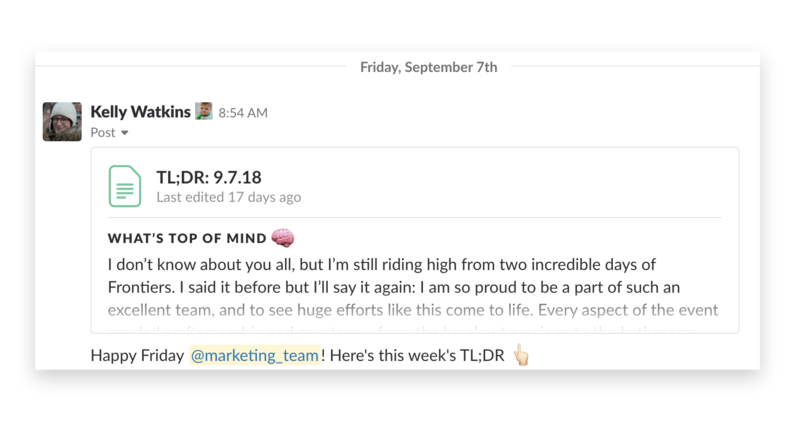 At Slack, executives post weekly or quarterly updates that cover our overall progress toward goals, mention recent hiring, and share confidential news before it’s announced to the public. If you use apps that automatically post progress to channels, try to reduce the “noise” in larger channels by having them post summaries or only on major milestones, so your team gets those updates on a slower schedule. This doesn’t mean you have to turn off automatic updates from all your apps—keep the task-by-task notifications in smaller machine-generated channels set aside for that purpose. Be extremely careful about issuing alerts, like @channel (everyone in a channel), @here (everyone currently online in a channel), and @everyone (every person in your Slack workspace) in larger channels. Posting a quick “@channel anyone up for lunch?” to eight of your colleagues in a small project channel makes sense but can come off as inconsiderate if you broadcast that to 500 people in different offices and time zones around the world. Reserve alerts in large channels for emergencies or rare moments when absolutely everyone should be aware of a major company milestone. This last tip is a small one, but when you’re on a busy workspace with thousands of others, everyone tends to be protective about their notifications. When you ask a question in a DM conversation, after you get your answer try saying thank you/you’re welcome 🙌, I agree 👍, or goodbye 👋 with an emoji reaction instead of another message. This reduces one more red indicator, sound, and potential interruption, and your recipient will see your confirmation in recent activity instead. Don’t worry about writing as formally as you might in an email. Speak freely in your natural tone (while remaining respectful). To encourage a speedy response, try to keep your messages concise and well-formatted; use emoji to add expressiveness or signal urgency. Gathering feedback? Consider using polls or surveys to collect information from many people quickly instead of having a discussion. If you make a typo in front of many people, it’s quite alright to hit the up arrow to quickly edit it to make the fix. No mistake has to be forever in Slack. As team sizes grow in Slack, you’ll want to remain thoughtful and courteous in your communication to make working in Slack as good as it can be. With a few small tweaks to how you use larger channels, you can help keep everyone stay up to date and on task while reducing potential distractions. 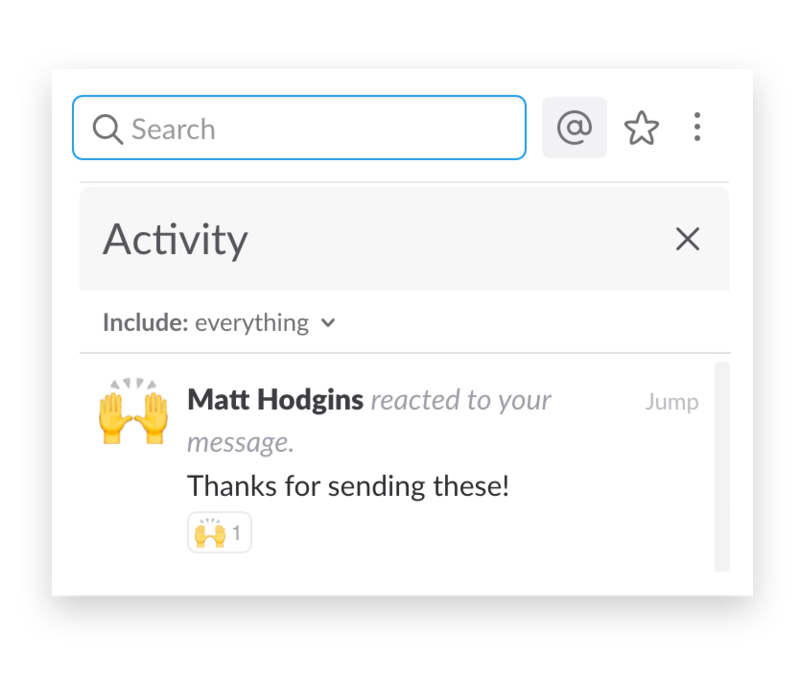 Matt Haughey suggests frequent checks of your activity view in Slack so you never miss reactions to anything you’ve written.